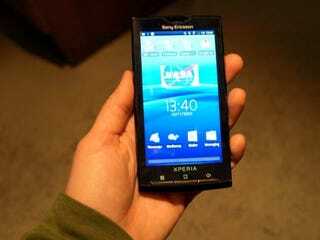 With a 1GHz Snapdragon chip from Qualcomm, 4-inch capacitive touch display, an 8.1 megapixel camera, and the lovely Rachael Android UI, the Sony Ericsson XPERIA X10 will be a great 2010 entry into the Android market for Sony Ericsson. Engadget's first impressions of the device are that the overall interface is currently more than laggy and that Snapdragon appears to be a killer on battery life, but we have to keep in mind that what was previewed is an early build right down to the software. By the time the phone is ready for stores, the Snapdragon chip, combined with a final build of the UI, should put the X10 among the fastest running phones on the market. As far as the unpolished UI goes, Sony Ericsson has already put some personal touches on there with Timescape and Mediascape, which aggregate all communication and media, respectively. While those features seem fantastic in theory, the early software build left questions as to just how seamless and smooth they truly are. There are some things that definitely appear lacking with the X10 which can't be blamed on the pre-production build though. For starters, there's barely any internal memory, though an 8GB MicroSD card is included to remedy that. The big annoyance is the absence of multitouch features such as zoom or rotate. With such a wide touchscreen, it's a shame to skip out on that.